BILLINGS, Mont. 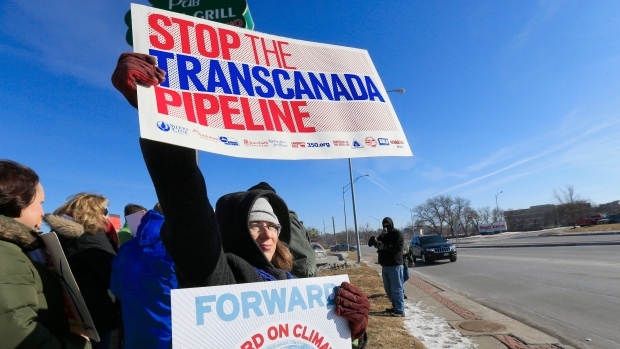 -- Opponents of the long-stalled Keystone XL oil pipeline asked a federal court Friday in a lawsuit to declare President Donald Trump acted illegally when he issued a new permit for the project in a bid to get around an earlier court ruling. "This is somewhat dumbfounding, the idea that a president would claim he can just say, 'Never mind, I unilaterally call a do-over,"' said William Buzbee, a constitutional scholar and professor at Georgetown University Law Center. The line would carry up to 830,000 barrels (35 million gallons) of crude daily along a 1,184-mile (1,900-kilometre) path from Canada to Nebraska. "We have confidence that the federal courts--long the protectors of our civil liberties--will once again rise to the challenge and enforce the Constitution and the laws of this land," Volker said.